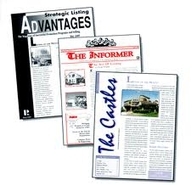 Have a periodic Newsletter you need printed? our black and white copy prices. This is just a basic guideline for newsletters. We also print newletters in other sizes or page configurantions. Please contact us with your specifications for a quote.